Q: I am considering the purchase of a 1950’s Chris Craft runabout. I have seen bottoms that have been re-done in ways that are not original, but the seller says they are “better than original.” Can you comment on the best practices in re-building bottoms? A: Thanks for your question; it’s a very good one, every owner of an old boat wonders about the same thing. Here’s my preferred way to handle old boat bottoms. Years ago when the Chris Crafts and other similar boats were being built, they did not have the products that we have today. In years past, bedding compounds were made of lead and linseed oils and used to keep water out of the hulls. The Chris Craft bottoms were double planked with canvas and bedding compound between two layers of wood. The canvas kept the water out until the outer layer of planking swelled tight. Years later the bedding compounds would dry out and lose their sealing ability. Often boat owners in an effort to stop the water from coming into the hull when the bedding compound was deteriorating would stuff caulking of some type into the outer layer of planking seams. This temporary fix seemed to be okay UNTIL the swelling planks had no where to move so they pushed up and outward from the keel pulling the frame ends apart at the chine. This resulted in a huge problem, the boat was falling apart. If you re-build a bottom using the old system, the same thing will happen. Propelling forward into today’s technology ~ the 5200 modern bottom. If you use this system, the boat is double planked and 3M’s5200 is used as a sealer; adhesive applied between the two layers and planks. This system seals the planks where they are glued together. In addition, an epoxy sealer is used to seal the visible parts of the boat and the outside of the hull thus totally encapsulating the wood. Just before the outside is sealed, spray the planks with water to bring the planks up to the proper moister content. This moisture actually swells the planks to their optimum size, seal the planks at this time and the planks will keep that size. In the photo, you will see I cover the bottom with sheet plastic to keep the moisture from drying too quickly (starboard side). The wood does stay stabilized, it won’t (or shouldn’t leak), this eliminates the wait time for the planks to swell, like yester-year, and best of all the boat will not fall apart. with your Boatwright and have an understanding of what he is telling you. We are very lucky these days with all the modern sealants available. So, the modern bottom is pretty neat, it is much stronger, doesn’t leak and lasts many years. I use the 5200 3M System on all my boats. This is all my opinion and others may differ, but I have years of proof and grand results. I completed a total restoration of a 1955 Chris Craft 22’, and have included some photos of the bottom re-do for you to view. To view more pho tos go to my website; http://KarlWeinertBoatWorks.com and click on Chris Craft and view the many photos posted. If you go through the photos you’ll see a pictorial of what will go into re-doing your hull bottom. You might find the whole restoration interesting viewing. 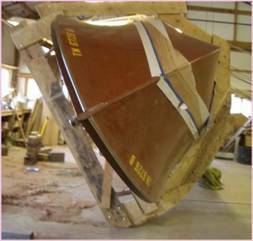 Readers: As always we’d love to be involved in your wooden boat restoration. You can check to see if we have an opening in the shop. *This article written by Karl appeared in the November/December 2007 issue of Classic Yacht. Karl is a regular contributor in the new online magazine. It is a stellar magazine, the subscription is free ~ here’s the url. Take a look! http://ClassicYachtmag.com/currentissue. Karl’s articles are normally around the high 80’s low 90’s pages and the column is titled, A Gain of Truth.